Growing up in East Tennessee, Joel always loved adventure (whether it came in the form of hunting or WERA endurance motorcycle racing); so it came as no surprise to his family when he received training for and earned open-water certification in 1992. Always immersing himself in the knowledge of his activities, he discovered the benefits of overhead training for skills refinement towards his ultimate goal (at that time) of wreck diving. With wrecks in mind, he came to Florida from Tennessee with David Rhea in 1994; and endured 7 days of “zero-to-hero”. This is also known as Cavern-to-Full-Cave training. At the end of class, he never looked toward wrecks again- he had found his passion in caves. As a matter of fact, his overwhelming cave passion almost cost him the BA in Anthropology that he’d worked so hard for! Since that time, he has continued his diving education and earned Trimix, DPV, IUCRR (active and experienced recovery diver), CCR, and Gas Blender certifications. He continues to study the latest research on CCRs and mixed gas physiology and learns more every day. Early in his cave career, he spent several months in the bottom of an East Tennessee lake, searching for a cave discovered by a friend who had recently passed away. When he and his dive buddy finally found Blindman’s Cave, they spent the next three years exploring and lining the unique find. 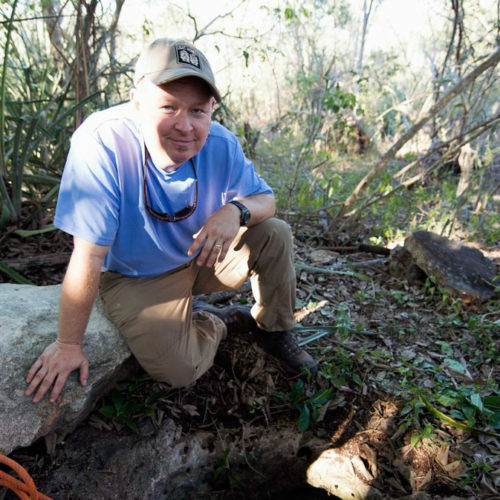 This experience ignited a fire for exploration, which has continued in projects at Manatee Springs, Florida, Weeki Wachee Springs, Florida, and Phantom Spring, Texas. Two of these projects won awards. He has also been involved in mapping projects of Ruth Walker and Charles Springs, Florida, for which he won a cartography award. He is a member of KUR (Karst Underwater Research) and ADM Exploration teams. His cave diving experiences include international and American sites; but his favorite dives are still those he shares with his wife of eleven years, Jacki. When Joel isn’t diving, he can be found designing and building exceptional technical dive products at his latest venture- Light Monkey Enterprises.